Can The Iceman Freeze Migraines? Can The Iceman Freeze Migraines, Forever? This article discusses new research on eliminating migraines with cryotherapy. You will learn about the autonomic nervous system, “the Iceman”, and the free steps to reduce or eliminate migraines with cryotherapy. Who is the Iceman? How do we freeze migraines, forever? Before I go on to explain why the Wim Hof Method has the potential to be more successful than any other migraine treatment to date, we need to evaluate the science behind cryotherapy and migraines. Cryotherapy, in the form of an icepack, is one of the oldest tricks in the book for immediately subduing migraine pain. But we’ll discuss how cold can be used to abolish migraines before they start in the first place. Don’t worry, if you hate the cold, this is for you. Cold freezes migraines in a revolutionary new study. A study published in the Journal of Neurosciences in Rural Practice in 2016 was the first of its kind to use cryotherapy to significantly reduce migraine pain and frequency (study link). Forty chronic migraineurs were divided into two groups: one that received hydrotherapy and conventional medication and a group that only received conventional medication. The hydrotherapy group received a hot foot and arm bath for twenty minutes while simultaneously being given an ice massage to the head and scalp for five of those twenty minutes. If this sounds familiar, you may have seen this popular treatment (photo above) shared by thousands of migraineurs across the Internet. Now this photo has scientific credibility. Subjects received the treatment every day for 45 days and the results were sensational. The intensity of the average-headache pain level for those that received hydrotherapy (Light blue) went from a score of 8.95 to only 2.10. Headache frequency (Dark blue) in the hydrotherapy group went from 10.65 headaches per month to 2.0 headaches per month! As you can see above, headache pain (Pink) and frequency (Red) in the medication-only group had mediocre success. Although the study was small, the results were powerful. Why was cold so successful? The researchers credited the success to the constriction and dilation of the blood vessels, the reduction of vascular inflammation, and the reduction of pain sensation in the nerves that are responsible for triggering migraines. Perhaps the greatest success the study demonstrated was the ability to influence the autonomic nervous system, specifically reducing the resting heart rate and stress levels of patients in the hydrotherapy group. Although the study was insanely successful, it has nothing on the Iceman’s ability to control his autonomic nervous system. The autonomic nervous system controls automatic functions such as heart rate, digestion, respiration, and the flight-or-fight response. The hydrotherapy study was based on a large body of research that indicates a poorly functioning autonomic nervous system may activate the trigeminal nerve and trigger migraines (study link, full study – this is fascinating). Interestingly, a test that immerses a hand into ice water and measures the autonomic nervous system response shows that migraineurs fail to properly react to this stimuli (study 1, 2). When you walk outside naked into a snowstorm, your body’s autonomic response releases norepinephrine to constrict blood vessels, tighten the skin, and shunt warm blood to vital organs. Migraineurs have poor autonomic function. To give you an idea of how poor the autonomic function is in migraine sufferers, we need to look at norepinephrine levels. Migraineurs generally have norepinephrine levels that are less than 60 percent of the levels found in a healthy person. One report showed migraineur norepinephrine levels as low as 41 percent when compared to a healthy person (study link). Individuals with pure autonomic failure have around 30 percent of the norepinephrine levels of a normal person. Migraine sufferers need more norepinephrine. Migraine sufferers are more likely to have cold hands and feet, become dizzy when standing up too fast because of low blood pressure, regulate temperature poorly, and on top of all of this, their over-sensitive trigeminal nerve may interpret those cold and hot temperatures as physical pain. Migraine sufferers could learn something from the Iceman. Nearly all migraine triggers are associated with oxidative stress, which turns into inflammation (study link). Inflammation can disrupt the function of the autonomic nervous system and lower our immune system (study link). This is the scariest part of a migraineur’s dysfunctional autonomic nervous system. A dysfunctional immune system isn’t just a concern over the likelihood of catching the common cold. A dysfunctional immune system leaves us open to numerous infections, chronic inflammation, chronic diseases, and numerous autoimmune conditions. This may be the reason migraines are associated with so many other conditions (Quora link). We can eliminate the sources of oxidative stress and inflammation that trigger migraines, but if you’ve read my blog or book, you know that this can be extremely complex. People that find all of their top migraine triggers can be migraine free in just three days, but individual triggers can be hard to find. The next best option is to strengthen the autonomic nervous system so that it can handle all of those hard-to-find headache triggers and eliminate the inflammation that comes with them. How do we control the autonomic nervous system? In a study two years later, the subject taught the method to twelve other people before a toxin was injected into them and a control group. The trained group showed that they could control the autonomic nervous system response that led to increased levels of anti-inflammatory markers, less inflammation, and fewer flu-like symptoms than the control group (study link). This changed science’s perception of the immune system and health. As you can see ↑, the trained group has higher levels of norepinephrine, the same norepinephrine that is missing in migraine sufferers. They also have a significant amount of epinephrine (fight or flight response) that is missing during a migraine sufferer’s response to cold. Epinephrine is used in emergency medicine for life threatening allergic reactions. It’s a serious anti-inflammatory known as adrenalin that blocks histamine and is perfect for blocking migraines (research 1, 2, 3, 4). The individual that taught this method was the Iceman and his technique is the Wim Hof Method. Cryotherapy lowers inflammation markers and fatigue in patients with rheumatoid arthritis (study link). Inflammation, fatigue, and autoimmune conditions are extremely common in migraine sufferers. New research suggests that cryotherapy could potentially restore hormone levels in patients with chronic-fatigue syndrome (study link). Hypothyroidism lowers hormone levels and is three times more likely to occur in migraine patients. Studies have shown that 80 percent of those with chronic fatigue have migraines (study 1, 2). Low progesterone and estrogen levels make migraines more likely during menstruation and restoring these hormone levels may reduce migraines with their natural ability to protect the human brain from oxidative stress (study link). Cryotherapy improves the quality of life in fibromyalgia patients (study link). Studies have found that 55.8 percent of fibromyalgia patients have migraines (study link). Cryotherapy improved movement ability and fatigue in multiple sclerosis patients (MS study link). Migraine prevalence is three times higher in those with MS (study link). Cryotherapy can lower oxidative stress and prevent excitotoxicity (study 1, 2, 3). Oxidative stress is suspected as the cause of migraines and excitotoxicity refers to a toxic release of glutamate that is associated with triggering migraines (study link). Winter swimmers show increased antioxidant protection (study link). Migraine research suggests increased antioxidant levels may battle oxidative stress and migraines. Cold-water swimming and other forms of cryotherapy relieve the symptoms suffered by asthma patients (study video. Cold-water showers can reduce symptoms of depression, anxiety, and stress (study 1, 2). Suicidal attempts are 2.5 times higher in migraine sufferers and 6.5 times higher in migraine sufferers with fibromyalgia than that of the general population (study 1, 2). Stress is the top migraine trigger (study link). Cold water tightens extremities and bathes the brain with nutrients and oxygen to help detoxify headache triggers (research link). Oxygen provides extreme relief for cluster headaches (study link) and there is some evidence it may benefit migraine sufferers as well (research link). A genetic mutation associated with migraine increases the risk of low oxygen absorption and high-altitude sickness (study 1, 2). Reduced oxygen may result in oxidative stress and low serotonin levels, both of which are associated with migraines (study 1, 2). The most popular form of cryotherapy is the ice bath used by numerous athletes to decrease muscle recovery time by reducing oxidative stress without slowing down muscle growth (study link). Reducing stress to muscles in the face and neck is critical to migraine prevention. For example, migraine is present in 55.3 percent of patients with muscle tension around the jaw (research link). This is because muscle tension can put pressure on the trigeminal nerve in the face and the occipital nerve in the neck, triggering migraines. Botox is extremely popular for paralyzing these muscles to reduce tension and migraines. Cooling the face decreases the heart rate, but improves blood flow to the brain (study link). Cooling the inside of the nose produced immediate migraine relief in 87 percent of patients in one study (link). This works on the same principle of numbing the SPG nerve that ultimately stops the trigeminal nerve from producing migraine pain. Numbing inside the nose has produced one of the highest success rates for rapidly halting migraines (Study 1, 2). Cold has the potential to harness this power to prevent migraines. A cryotherapy study that significantly reduced migraine pain attributed cold’s ability to slow down the transmission of nerve signals (study link). The latest migraine research has found that the trigeminal nerve (in the face) is overly sensitive in migraine sufferers and triggers migraines by rapidly releasing glutamate and calcitonin gene-related peptide (CGRP) (study link). A drug that blocks CGRP is shaping up to be the most successful migraine medication ever developed (study link), but it seems that cryotherapy may have the power to prevent excessive amounts of CGRP from being released in the first place. Millions of dollars are being poured into the migraine research of controlling the release of CGRP. New research has shown that CGRP is released to regulate inflamed tissue, noxious heat, and pain from…cold! If we can harness cold, we may be able to control CGRP and migraines (study 1, 2). Research on Wim Hof and others has found that cold can increase brown fat (research link). Brown fat is actually found in skinnier individuals. Brown fat burns calories during cold temperatures and may reduce fat and glucose levels (study 1, 2, 3). Cold weather can quadruple your metabolic rate—what you might call your metabolism (study link). Obesity may increase migraine risk by 81 percent and migraines are associated with poor metabolism (study link). A popular surgery for migraines is implanting an electrical stimulation device that costs about $75,000 and comes with a high risk of infection and migration of the stimulator (study 1, 2, 3). Other electric stimulation devices can be worn like a headband, such as the cefaly, to prevent and reduce migraine pain. New research is showing that cryotherapy may have the same effect as electrical stimulation (study 1, 2, 3). 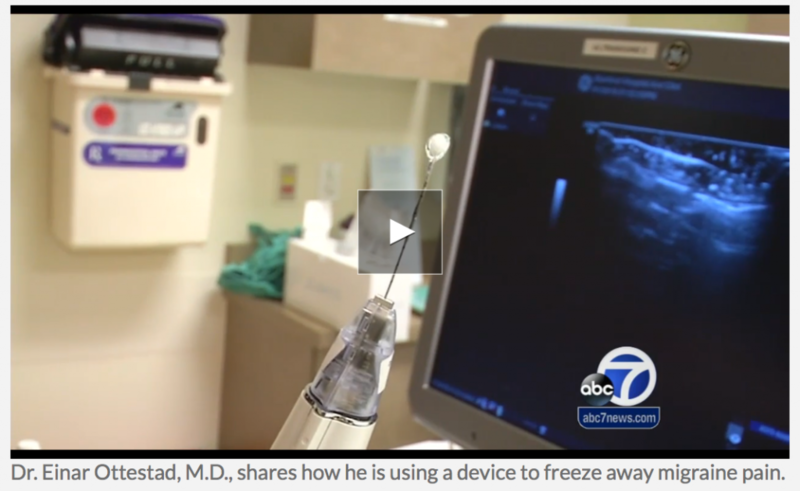 Cryoneurolysis is a new treatment that uses a tiny ball of ice to “short circuit” chronic pain caused by neuralgia (nerve damage or irritation). A recent study took the pain scale of neuralgia patients from 8 out of 10 to 2.4 and the relief lasted for two months (study link) or as Stanford University calls it an “utterly horrible pain” ranking of 8/10 to a discomforting light pinch that is a 2/10 (Stanford pain scale). Discomfort to the trigeminal nerve and “trigeminal neuralgia” is 6.72 times more likely in migraine patients than in healthy individuals (study link). Stanford doctors are now using this procedure for migraines. Cold-water exposure improves mood, memory, and fatigue (study link). Who doesn’t need that? The Wim Hof Method is likely to be a top migraine treatment because it combines both cryotherapy and the best relaxation techniques that I have ever tried. He attributes his success changing the way science thinks about the autonomic nervous system to increasing vascular strength and oxygen intake from controlled breathing. One of the first exercises in his ten-week course is to take thirty deep breathes in and out, and after your last exhalation, you hold your breath for as long you can without oxygen in your lungs. When you finally inhale, you hold that fresh oxygen for about fifteen seconds. The cycle then repeats three or four times. My oxygen retention went from about one minute to about four minutes by the end of the course. I’m telling you this secret to make the point that oxygen perfusion is increased by his method. The Iceman also utilizes stretching after deep breathing to bring oxygen to your muscles. We know that oxygen may benefit migraines, but forcing oxygen into the muscles may do something that the Iceman has only suggested without scientific proof. A 2015 study has shown that forcing oxygen into the muscles can heal muscular stress with 70 percent of fibromyalgia patients recovering from all symptoms after two months of hyperbaric oxygen treatment (study link). We know that an absurd amount of fibromyalgia patients have migraines as well as the fact that migraines are severely affected by muscular inflammation and all of these factors may be changed by the Wim Hof Method. Wim Hof’s breathing technique is my favorite because, and I’ve tried many, it is the fastest way to mental and full body relaxation. Breathing relaxation techniques alone are scientifically proven to be a top migraine treatment and I discuss this in depth here. The Iceman’s ten-week course is a little pricey, but I found it well worth it for a lifetime of knowledge guided by quality video instructions (I have no affiliation with Wim Hof). I view this program as one of the single greatest improvements in my life. There is not a day that I miss a cold shower. I went from absolute hatred of the cold, to looking forward to a cold shower and feeling better than I ever have on so many levels. Take a cold shower. Start by taking a nice long hot shower and then slowly reduce the temperature to cold at the end. Try to stay in the cold for thirty seconds. Every week, increase the amount of time spent in the cold. If you sufferer from migraines, this will be a slow process and it could take months to strengthen the autonomic nervous system. This is the entire point: you strengthen the autonomic nervous system so that you can handle cold and migraines. Don’t worry, your body adapts to the cold. When you feel ready, start by jumping directly into a cold shower and see how long you can go. Two to ten minutes of cold therapy makes me feel incredible every day. Don’t rush yourself, increasing brown fat and strengthening the autonomic nervous system takes time. Start breathing exercises. One of my favorite exercises is Navy SEAL breathing: four-second deep breaths in followed by four-second deep breaths out. Do this for ten minutes in the morning, ten minutes at night, and for short periods throughout the day (full article). You can also try the breathing method discussed by Wim Hof in the Vice documentary above. Try the therapy from the first study mentioned by putting your arms and feet in hot water for twenty minutes with an ice pack on your head for five of those twenty minutes. Do this every day. Slowly improve the cryotherapy portion by using multiple ice packs on the neck, head, and face: you want to strengthen all the nerves directly associated with migraines. It is also critical to understand that migraines and the autonomic nervous system are affected by the entire body. For this reason, cold therapy to the entire body will be more beneficial than just an icepack on the neck. An abundance of research is showing that cold may be one the most important factors for completely eradicating migraines. Migraine sufferers have increased levels of inflammation, increased oxidative stress, increased levels of overall stress, poor autonomic nervous system functioning, and numerous problems that are all significantly altered by cold therapy. Yes. Not long ago I wrote the “8 ways to eliminate migraines—forever.” The number one thing you could do is become a migraine expert. Cryotherapy could be the second most important thing you could ever do to eliminate migraines. It’s critical to remember that you still want to eliminate the source of inflammation actually causing your migraines, however, cryotherapy looks like it may be able to stop those migraine triggers and the inflammation they bring from transpiring into migraines. If you follow this research and keep in mind the guide to eliminating migraines, you will be unstoppable.